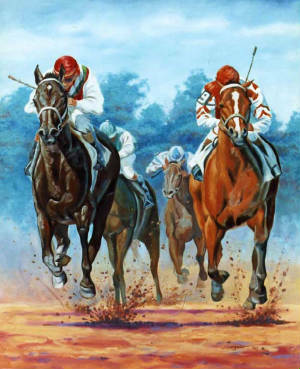 This is the work Delgado created after witnessing perhaps one of the most exciting finishes in Preakness history, one of the jewels of the 1989 Triple Crown. The original created in watercolor, captures the excitement of these two great champions dueling to cross the finish line first. During this historical Triple Crown it essentially became a match race each time they met. SUNDAY SILENCE was victorius in the Kentucky Derby and the Preakness (depicted here) with EASY GOER winning the fianl leg, the Belmont. A limited Edition Lithograph was produced and is prize by Racing fans and collectors around the world. The remaining collector prints are only available here. Each comes signed and numbered by the artist. 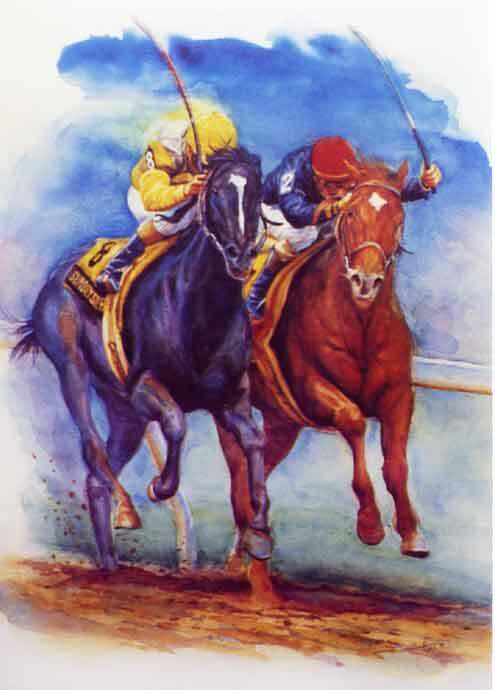 $350.00 limited edition lithograph of Sunday Silence vs. Easy Goer, signed by artist. Shipping included. $400.00 Easy Goer vs Sunday Silence, artist proof signed by arist, shipping included. 24" X 18" Printed on glossy stock.